In March of 2002, the first meeting took place to negotiate the new contract for May 1st. The negotiations continued until it was obvious no agreement was going to be reached. Local 455 voted to go on strike for economic reasons. We continued to meet with the contractors with very little success. Four weeks into the strike, the UA was brought in to assist us in the negotiations. An offer was made to the contractors by the UA. This was rejected by the contractors. 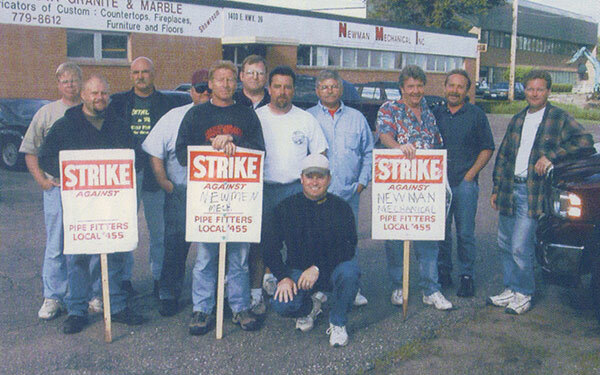 The strike continued for almost eight weeks before a settlement was reached. It should be noted that we worked without a contract for one week, to bargain in good faith, to no avail.